L. amictus adult in Kwazulu-Natal, South Africa. Physical description: Similar in size to amictus. Reddish orange dorsum with black membrane and head. Head is red behind the eyes. Scutellum is dark with yellowish-red margins. Pronotum is broad and slightly more rounded than that of amictus. 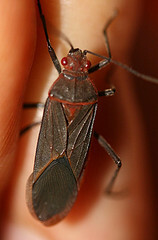 Ventral side dark in color with red around coxae. Appendages are black or brownish-black.